In today’s world, trade policy influences all areas of public policy. Regardless of the form Brexit takes, it means we need the United Kingdom to establish a robust modern, inclusive and democratic governance model to oversee trade policy that has broad legitimacy in society and produces policy priorities that are also a balance of socioeconomic priorities. 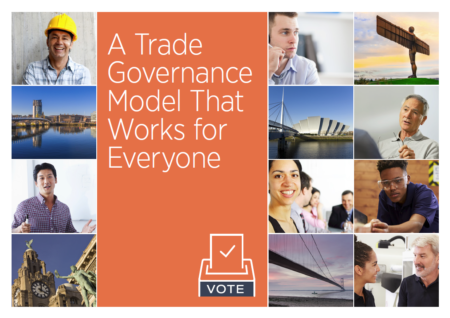 A Trade Model That Works for Everyone is supported by an informal alliance of organisations including the British Chambers of Commerce, Confederation of British Industry, Federation of Small Business, Institute of Export and International Trade, ICC United Kingdom, Trade Justice Movement, TUC, UNITE the Union and 85 others. It provides a practical framework for national and international policy makers to guide best practice and help governments deliver on global commitments.